The Chamblee Bulldogs set four DeKalb County Swimming and Diving Championships records on the way to their third consecutive county title on Saturday at Dynamo Swim Club. Three of the records were all three relay events including the 200 yard medley relay to open the day’s competition. 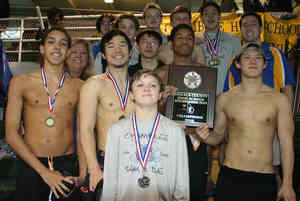 The team of Nick Oh, Jacob Jordan, John Mitchell and Wesley Cheung came out fast knocking 3.51 seconds off a the 38-year old record of 1:41.40 set by Dunwoody in 1977. Cheung hit the wall and the clock 1:37.89 to set the tone for the rest of the day in the boys’ competition. Four more boys’ records would fall on the day and one girls’ record for six total new marks set in a fast 45th edition of the DeKalb County Championships. Chamblee won eight 12 events on the day on the way to piling up 265 points for a 62 point victory over the Lakeside Vikings (203) while Dunwoody finished a distant third with 162 points. Noah Oh gave the Bulldogs two consecutive wins to open the meet as he finished just .43 seconds off another record in winning the 200 freestyle in a time of 1:43.88. The next record to fall came in the 100 freestyle as John Mitchell swam 46.62 to break the 1996 record of 47.11 set by Lakeside’s Chris Read. The relay team of Nick Oh, Mitchell, Cheung and Jordan set their second new standard of the meet by swimming a DeKalb County record 1:27.52 to trim 3.19 seconds off the old record of 1:30.71 set by Lakeside in 2006. The two-time record setting trio of Nick Oh, Mitchell and Jordan were joined by Noah Oh in the 400 freestyle relay to finish off the boy’s completion with another record setting performance of 3:14.06. The foursome trimmed an amazing 5.59 seconds of the 1990 record of 3:19.85 set by Dunwoody. Other Bulldog winners included Jacob Jordan in the 50 freestyle (21.75), Caleb Wickle in one-meter diving (424.60) and Noah Oh won his second gold medal with a time of 4:45.14 in the 500 freestyle. All eight Chamblee gold medal winners were repeat champions from the 2014 meet. Tucker’s Cash DeLoach sets his third county record with 200 IM victory. Tucker’s Cash DeLoach, a University of Southern California signee, put his third mark in the DeKalb County record by winning the 200 individual medley in a record setting time of 1:55.26 breaking former Lakeside star Jack Lane’s time of 1:55.80 set in 2009. DeLoach who won two gold medals on the day, the second coming in the 100 butterfly, set the butterfly mark (50.35) and backstroke (51.46) in the 2014 Championships. Other gold medalists included Dunwoody’s Christopher Thames in the 100 backstroke (51.62) and Druid Hills’ Jackson Ford who won the 100 yard backstroke for the second consecutive season with a time of 1:00.19. The Dunwoody Lady Wildcats got their championship off to a fast start as well as the team of Laura Spratling, Allie Reiter, Hannah Robinson and Kaleigh McGrady opened up with a record setting performance in the 200 medley relay following the Chamblee lead. A record setting time of 1:52.15 knocked 3.72 seconds off the mark set by Dunwoody in 1992 and set the tone for eight gold medal wins for the Lady Wildcats. 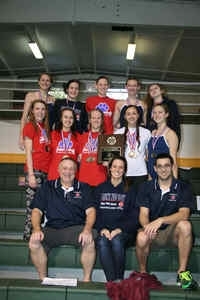 Dunwoody would tally 265 points to out swim Lakeside’s 224 and break a three-year win streak for the Lady Vikings. 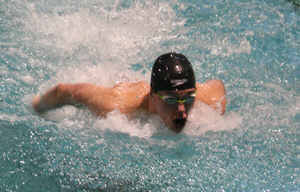 The title is the 15th for Dunwoody spurred on by a pair of swimmers capturing two individual gold medals on the day. Allie Reiter repeated as the 100 breaststroke champ (1:07.11) and captured the 200 individual medley (2:12.94). Laura Spratling who won a pair of gold medals in 2014 as well won two entirely different events in taking the 100 backstroke (1:00.39) and 100 butterfly (59.89). Kaleigh McGrady, who teams with Reiter, Spratling and Hannah Robinson for two relay gold medals, brought home the individual gold in the 100 freestyle (55.08). The foursome pulled off Dunwoody’s second consecutive DeKalb County gold medal in the 200 freestyle relay with a time of 1:44.89. Dunwoody’s Allie Reiter took home a pair of gold medals from the DeKalb Co. 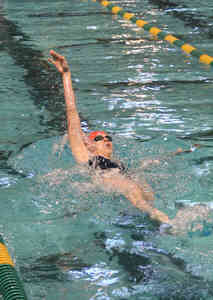 Swim and Dive Championships. Diver Abbey Yates won her second consecutive county title with a score of 385.95 in the one-meter diving event. Druid Hills’ Lauren Ford doubled up on gold medals with wins in the 200 freestyle (2:03.01) and 500 freestyle (5:31.42). Lakeside’s lone win in its strong second place finish came with a repeat gold medal from 2014 in the 400 freestyle relay by the team of Nicole Hollahan, Julianna Cartwright, Julia Shuford and Rachel Hu with a time of 3:51.16. Decatur’s Tori Brierly rounded out the gold medal winners by capturing the 50 freestyle in a time of 25.25.